What’s better than a PB and J sammie with a frosty glass of milk? 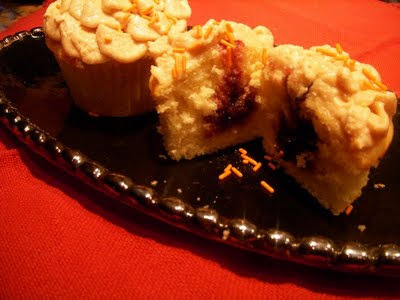 How about a jam-filled cupcake slathered with peanut butter frosting? What’s even better than that? You and your grandbaby can bake this sweet treat in just minutes and have a gaggle of giggles in the process. The batter is a simple vanilla cake that you bake and then cool. Use a pastry bag with tip to fill the cupcakes with your favorite jam. Kuhn Rikon has an affordable, colorful, child-friendly cake decorating kit that works well for filling cupcakes. It’s available at Sur La Table and is one of Nana’s Favorite Things. A simple substitute for pastry tips is a clean ketchup or mustard squeeze bottle. It’s perfect for jamming the jam! After filling the cupcakes, whip together some creamy peanut butter, confectioner’s sugar and some room temperature cream cheese for the frosting. You can use the tips that come in the kit to create stars, leaves, or ribbons of frosting over the top of the cupcakes. All that’s left is to pour the milk, clink glasses and take big, big bites.